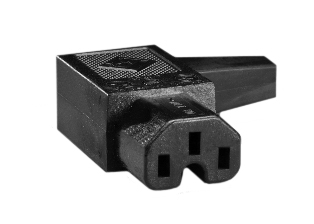 IEC 60320 C15 IN-LINE CONNECTOR, 15 AMPERE-250 VOLT (UL/CSA). 10 AMPERE-250 VOLT (VDE). 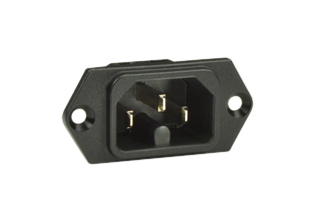 TERMINALS ACCEPT 14 AWG (2.5 mm2) CONDUCTORS. ACCEPTS 7 mm DIA. (0.276 ) CORDAGE. BLACK. Description: 15A-250V IEC 60320 C-15 CONNECTOR, UL, CSA, VDE APPROVALS, 2 POLE-3 WIRE GROUNDING (2P+E). BLACK. TERMINALS ACCEPT 18AWG-14AWG CONDUCTORS. STRAIN RELIEF ACCEPTS 7 mm DIA. (0.276) CORD. Note: Power cords, Plugs, Connectors, Power Inlets, Plug adapters listed below in Related products. 15A-250V, IEC 60320 C-15 CONNECTOR. BLACK. TERMINALS ACCEPTS 18 AWG-16 AWG CONDUCTORS. STRAIN RELIEF ACCEPTS 8.7 mm DIA. (0.343") CORD. 10A-250V, 15A-125V IEC 60320 C-15 CONNECTOR, (UL/CSA APPROVED), TERMINALS ACCEPTS 10/3, 12/3, 14/3, 16/3, 18/3 AWG CONDUCTORS, MAX.- MIN. STRAIN RELIEF= .300"-.655" DIA. CORD. BLACK. 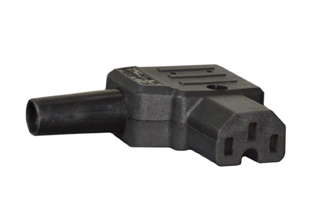 10A-250V IEC 60320 C-15 CONNECTOR, (VDE,DEMKO, FI, KEMA, NEMKO, SEMKO, SEV APPROVALS), TERMINALS ACCEPT 18 AWG-12 AWG CONDUCTORS, MAX. DIA. CORD =(0.354 ). BLACK. 15A-250V IEC 60320 C-15 RIGHT ANGLE CONNECTOR, (UL,CSA,VDE APPROVED), TERMINALS ACCEPT 18 AWG-14 AWG (2.5 mm2) CONDUCTORS. MAX. DIA. CORD=(0.276"). BLACK. 15A-250V IEC 60320 C-15 RIGHT ANGLE CONNECTOR, (UL,CSA,VDE APPROVED), TERMINALS ACCEPT 18 AWG-14 AWG (2.5 mm2) CONDUCTORS. MAX. DIA. CORD=(0.335"). BLACK. 10A-250V IEC 60320 C-15 RIGHT ANGLE CONNECTOR, (VDE, CEBEC, DEMKO, FI, KEMA, NEMKO, OVE, SEMKO, SEV) APPROVED, TERMINALS ACCEPT 18 AWG-14 AWG CONDUCTORS, MAX. DIA. CORD =(0.335 ). BLACK. 10A-250V IEC 60320 C-15 DOWN ANGLE CONNECTOR, (CEBEC, DEMKO, FI, KEMA, NEMKO, OVE, SEMKO, SEV, VDE) APPROVED, TERMINALS ACCEPT 18 AWG-14 AWG CONDUCTORS, MAX. DIA. CORD =(0.335 ). BLACK. 15A-125V DETACHABLE POWER CORD, NEMA 5-15P TYPE B PLUG, IEC 60320 C-15 CONNECTOR, 14/3 AWG, SJT, 105 DEGREE C, 2.44 METERS (8 FEET) (96") LONG. BLACK. 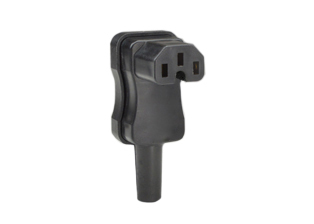 15A-125V DETACHABLE POWER CORD, NEMA 5-15P TYPE B PLUG, IEC 60320 C-15 CONNECTOR, 14/3 AWG, SJT, 105 DEGREE C, 0.9 METERS (3 FT.) (36") LONG. BLACK. 15A-125V DETACHABLE POWER CORD, NEMA 5-15P TYPE B PLUG, IEC 60320 C-15 CONNECTOR, 14/3 AWG, SJT, 105 DEGREE C, 1.8 METERS (6 FEET) (72") LONG. BLACK. 15A-125V DETACHABLE POWER CORD, NEMA 5-15P TYPE B PLUG, IEC 60320 C-15 CONNECTOR, 14/3 AWG, SJT, 105 DEGREE C, 3.05 METERS (10 FEET) (120") LONG. BLACK. 15A-125V DETACHABLE POWER CORD, NEMA 5-15P TYPE B PLUG, IEC 60320 C-15 CONNECTOR, 14/3 AWG, SJT, 105 DEGREE C, 4.6 METERS (15 FEET) (180") LONG. BLACK. 15A-250V POWER SUPPLY CORD, IEC-60320 C-15 CONNECTOR, UL/CSA LISTED, SJT, 14/3 AWG, 105� C, 2.44 METERS (8 FEET) (96") LONG, STRIPPED ENDS. BLACK. 15A-250V POWER SUPPLY CORD, IEC-60320 C-15 CONNECTOR, UL/CSA LISTED, SJT, 14/3 AWG, 105� C, 3.05 METERS (10 FEET) (120") LONG, STRIPPED ENDS. BLACK. 15A-250V POWER SUPPLY CORD, IEC-60320 C-15 CONNECTOR, UL/CSA LISTED, SJT, 14/3 AWG, 105� C, 4.6 METERS (15 FEET) (180") LONG, STRIPPED ENDS. BLACK. 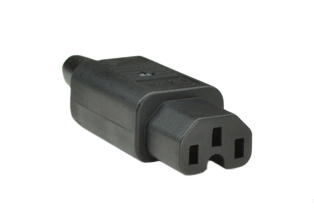 15A-250V PLUG ADAPTER, IEC 60320 C-20 PLUG, C-15 CONNECTOR, SJT, 14/3 AWG, 105C, 0.3 METERS (1 FOOT) (12") LONG. BLACK. 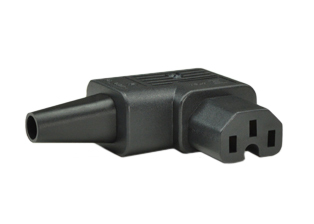 15A-250V PLUG ADAPTER, IEC 60320 C-20 PLUG, C-15 CONNECTOR, SJT, 14/3 AWG, 105C, 0.9 METERS (3 FEET) (36") LONG. BLACK. 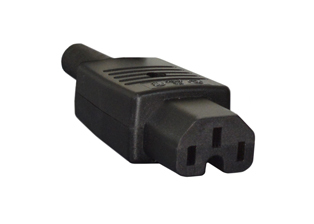 15A-250V PLUG ADAPTER, IEC 60320 C-20 PLUG, C-15 CONNECTOR, SJT, 14/3 AWG, 105C, 1.8 METERS (6 FEET) (72") LONG. BLACK. 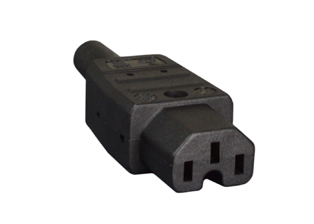 15A-250V PLUG ADAPTER, IEC 60320 C-20 PLUG, C-15 CONNECTOR, SJT, 14/3 AWG, 105C, 2.44 METERS (8 FEET) (96") LONG. BLACK. 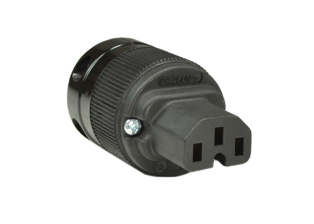 15A-250V PLUG ADAPTER, IEC 60320 C-20 PLUG, C-15 CONNECTOR, SJT, 14/3 AWG, 105C, 3.05 METERS (10 FEET) (120") LONG. BLACK. 15A-250V IEC 60320 C-16 PANEL MOUNT POWER INLET, 6.3 x 0.8 mm (0.250" x 0.032") TERMINALS. BLACK. Note: Mates with C-15 Power Cords, Connectors. 15A-250V IEC 60320 C-16 PANEL MOUNT POWER INLET, 4.8 x 0.8 mm (0.189" x 0.032") TERMINALS. BLACK. 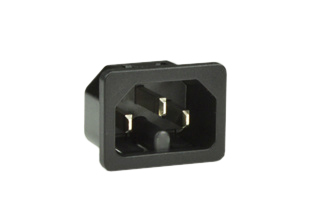 15A-250V IEC 60320 C-16 PANEL MOUNT POWER INLET, 3.5 x 0.8 mm (0.138" x 0.032") SOLDER TERMINALS, BLACK. 15A-250V IEC 60320 C-16 POWER INLET, SNAP-IN MOUNT FOR 1.5 mm THICK PANELS, 6.3 x 0.8 mm (0.250" x 0.032") QUICK CONNECT TERMINALS. BLACK. 15A-250V IEC 60320 C-16 POWER INLET, SNAP-IN MOUNT FOR 1.5 mm THICK PANELS, 4.8 x 0.8 mm (.187" x .032") TERMINALS. BLACK. 15A-250V IEC 60320 C-16 POWER INLET, SNAP-IN MOUNT FOR 1.5 mm THICK PANELS, 3.8 x 0.8 mm (.138" x .032"). SOLDER TERMINALS. BLACK.